Services — Tree Works, Inc.
Tree Works’ Services—Where Art and Science Converge. When we’re tasked with helping one of our customers improve, maintain or alter their landscape, we consider more than just what meets the eye. That’s because there’s a whole world beyond the obvious, like root systems, soil conditions and the integrity of plants that may appear healthy but are actually hiding vermin, diseases or infestations that are raging below the surface. Some trees are simply not meant to coexist in small spaces. Many homeowners make the mistake of planting trees that grow too large to adequately maintain. Eucalyptus, for example, can pose a serious threat to homes when planted too close—and many owners have had to deal with these behemoths crashing into their roofs. Vines pose another often overlooked hazard. Many of them are toxic and the sheer weight of them—deadly or not—can cause large trees to topple over. We’ll remove these and other plants that pose problems to your property. The Gyro Trac GT-25XP is a phenomenal piece of equipment. It is a serious all terrain mulching machine. 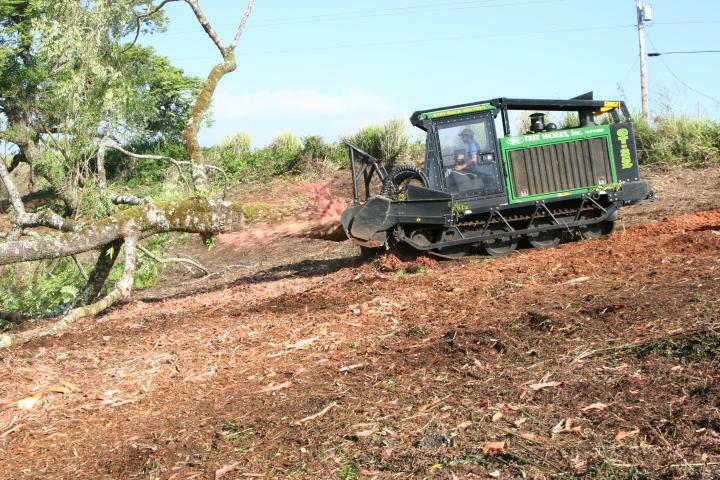 Great for land clearing, it will mulch trees and brush on all types of terrain. No longer is bulldozing or hand clearing the only option. If you wish to keep the topography of your land intact but need the land cleared for building, contact us for a demonstration or view some of our previous work! Use the mulch for landscaping and create a relaxing haven using your own resources… at no extra cost! Did you know that the best and most economical time to prune is early in the season, when the buds begin to break and you can actually pinch off the soft tissue with your fingers? That’s why they call it “nipped in the bud.” But really, there’s more to a fruit tree than well, the fruit. To cultivate the greatest yields (and tastiest offerings), one should be careful to prune and train young trees so that they lead long, productive lives—and also prevent future injuries that may result from weak crotches that break under wind or heavy fruit loads. Call on us to help you do just that. First off, we don’t just prune. We assess the health of each plant to ensure that diseased, non-productive or unwanted portions of a plant are removed, while carefully shaping each plant to harness optimal sunlight and yield high-quality flowers. This is a skill and an art, as poorly pruned plants can become infested or overgrown—and wreak havoc on the rest of your yard. Some plants are high maintenance. But it can be hard to know how to get at the root of the problem (sorry, we couldn’t resist the pun). Root pruning can reduce a plant’s ability to intake water and nutrients, changing its carbohydrate-nitrogen balance and slowing its growth. We can remove exposed roots or girdling roots—the pesky type that wraps around young plants—as soon as you notice them. Stumps can be a great place to sit back and relax in your garden—or they can be an eyesore rotting from the inside out. Even worse, they can destroy your lawn mower, leaving you with not only a stump ripe for infestation, but also an overgrown ambush. 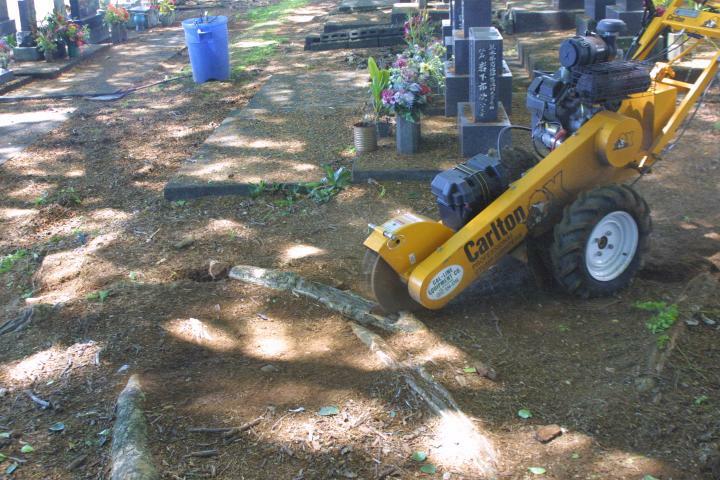 If you’re ready to eradicate your stumps, we have the perfect solution. By grinding your stumps or even exposed roots into mulch, we offer an economical and environmentally friendly method of surgically removing the unwanted part of your yard. We even do this on site so you can see exactly how it all works. Tall trees can pose major risks. Lucky for you, we can take care of those hazards with our Aerial Trucks and Cranes, which allow us to reach the top of any tree. Even better? We’ll give you an estimate for free. You worked long and hard cutting down unwanted or unsafe trees, eradicating unwanted bushes, ripping out ugly brush or trimming low hanging branches. But now you have a bunch of debris that the dump doesn’t want and no one will take away. That’s when you can call on us to help. We’ll stop by with our handy chipper and within minutes, those annoying remnants of your labors will be wiped clean.